You may have noticed that this site revolves around an interesting mix of topics. One combination that might fascinate people is the link between the industrial design that we showcase and the handmade goods we sell. I suppose all these can be grouped under one heading, the ‘initial stages of the design process’. This means turning sketches and drawings in to physical entities, bringing them in to the real world via a favoured medium. It’s the starting point for a prototype or even a final piece of work that’s gone through many iterations. Each has a handcrafted element to it, and every product has to go through these stages no matter how they end up being produced. The combination of craftsman and designer has always intrigued me, and this has been put in to practice by German-Finnish creative Pia Wüstenberg. The vessels she’s produced are made from rich gem-toned, hand-blown glass and a single wooden branch, sourced from Wüstenberg’s native Finland for its specific organic shape. When the bowls are produced in the hot shop the branch is pushed into the hot glass shaping and opening the vessels mouth, not only does this mean a perfect fit for the lid it also chars the wood and show the scars of the making process. Combining the two contrasting materials in such a manner has been documented in this short film below by James Maiki, it set me up perfectly for the day ahead. A highlight for me has to be the glass blowing imagery, showing glassblowers James Devereux and Katherine Huskie at work in their studio. It’s this collaboration that’s pushed Pia’s idea to fruition, without their help it wouldn’t be possible. You have to admire Pia’s passion for craft and highlighting the benefits of working with such makers. 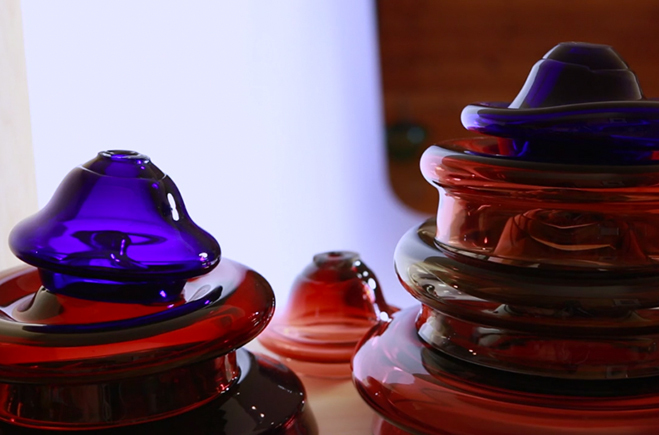 The glass vessels that she’s designed are being exhibited at this years Salone Internazionale del Mobile in Milan, I won’t spoil it too much but I hope you’ll watch this piece and take away something from the story. You should also head over to siblings Pia and Moritz Wüstenberg’s company Utopian and Utility that hopes to highlight the beauty of craft and the value in these skills.